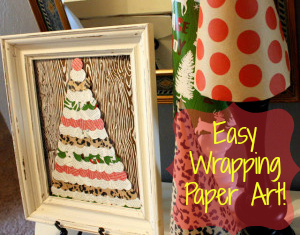 DIY Easy Wrapping Paper Art! 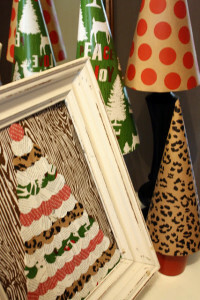 You are here: Home / Holidays / Making A Merry Christmas / DIY Easy Wrapping Paper Art! 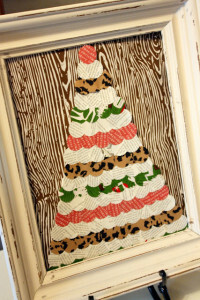 I (Emily) made this easy wrapping paper art in less than 15 minutes with items I already had in my home and you can, too! 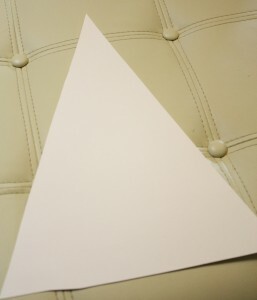 My project started by cutting a triangle out of poster board. I freehanded this, but feel free to use a straight-edge or a template. I’m not that into straight lines. Obviously. 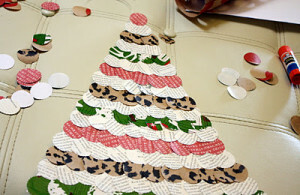 Starting from the bottom, I arranged lines of circles on my tree, glueing them as I went. I decided to do every other line out of the book print because…well, no reason. Just because. Many lines later, I placed my final, red circle on the tree. That process took me a total of 7 minutes. I found a sheet of woodgrain wrapping paper in my closet that I’d picked up at Paper Source last year. I think it’s perfect for this project! 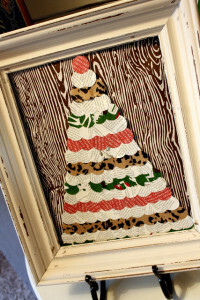 I cut the paper to fit inside an old frame (minus the glass) and attached the tree to it using double-sided tape. I doubled up my double-sided tape to lift it off the woodgrain a bit. And, that was that. Another 7 minutes gone. I love fast projects!! 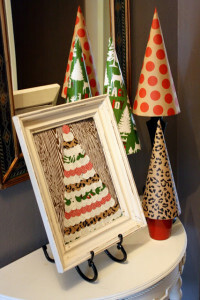 I love these projects because A) they were super fast to complete B) they only cost me supplies from my closet and C) they can be 100% tailored to your own personal Christmas decor. Is your wrapping paper Silver and Gold? Blue and White? Turquoise and Red? Yep, those colors will work too. See what I mean?! Perfectly tailorable! Now following you from Happy Accidents. Awesome! Love it!! 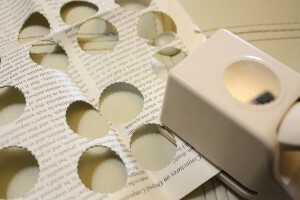 I must share this..
thanks for linking up this to my create and inspire linky party! Hope to see there tomorrow friday!! 🙂 Thanks! Oh my goodness! These are DARLING!!! 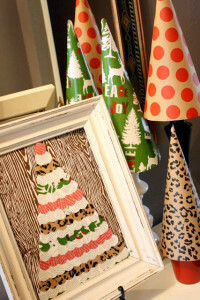 I totally LOVE this DIY Christmas tree and it looks so simple, too!! !